The amber is carved in the form of a stylised lotus leaf with a shallow hollowed well and a recessed circular depression in the middle of the ink palette. The exterior is decorated with branches of a blossoming lotus flower, a lotus pod and a lotus leaf tied together and flanked by a clambering chilong dragon. 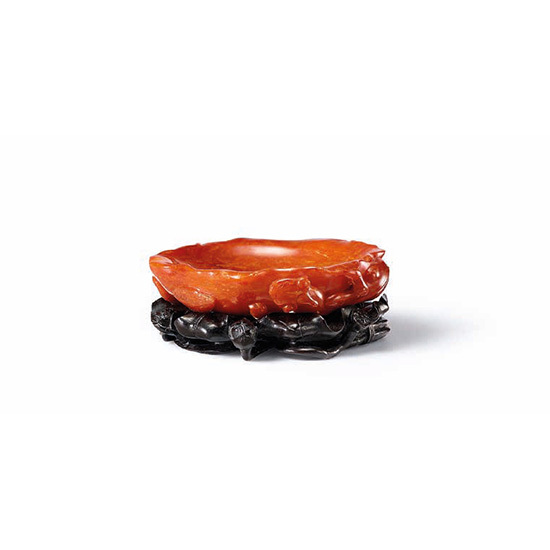 The bright orange amber is opaque and polished to a glossy finish. The ink palette rests on a shallow hongmu base with a corresponding design.